The Patient Network meeting will take place on Sunday 21 November in Brussels. This will be followed by a two day Extended Network meeting for patients, project partners and any other interested parities on 22 and 23 November. 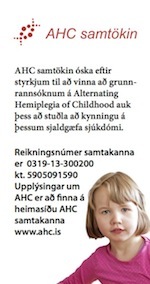 Sigurdur Johannesson and Ragnheidur Hjaltadottir will be represending AHCAI during this meeting. It is very interesting and very nicely done with some new information that will make a difference for alot of parents. AHCAI was invited to join EURORDIS ( www.eurordis.org ) for a meeting in London March 2009. First there was a couple from Nederlands with 7 year old daughter with AHC and 5 year old daughter not affected. Founded the foundation in the Nederlands. 4 from Denmark (Danish association) 2 couples that have daughters. We (Sigurdur, Ragnheidur and Sunna) were invited by the AHC association of the United States to join them in a family meeting in Chicago. This would be a 2 days meeting with speakers from the States, Canada and France. Also a team of specialists that Dr. Swoboda from the University hospital of Utah headed would be examining the patients. Vinsamlega kíkið við síðar. Vefurinn er í vinnslu.